Can Hail Damage Result in Replacing an Entire Roof? Most people are aware of the damage hail can cause by damaging and denting cars. This awareness doesn't always translate into the impact a hail storm can have on your home's roof. While you can visually see the damage to your car after a hail storm, you can't always see the damage to a roof. The damage you can't see can put the longevity of your roof at risk. - Bruises or small dents in the asphalt shingle / Granulation is displaced exposing the asphalt. - Granulation has settled at the base of your downspouts / The spots hit by hail usually leave a soft spot in the shingle. - Damaged metal air vents on the roof indicate similar hit pattern for roof / Damage and denting of siding or gutters. Have your roof inspected / evaluated by a local reputable roofing contractor to determine if there’s damage & the extent of damage. If my Roof is damaged, how fast should I replace it? The threat is in the longevity of the roof, hail can dramatically decrease a roof's life expectancy. Will Homeowner's Insurance Cover a New Roof? For most homeowners the answer is "yes". If you are unsure if your homeowner's policy covers hail damage to your roof, contact your insurance company. Don't wait too long to call your insurance company. Some companies have time limits for reporting the damage. When storms hit North Texas, it’s not uncommon to see an influx of out-of-town roofers — “storm chasers” — who often leave town not long after the storms do. How can you determine if you’re hiring a legitimate roofer who’ll be around after the storm season? Are they in good standing with the Better Business Bureau (BBB)? 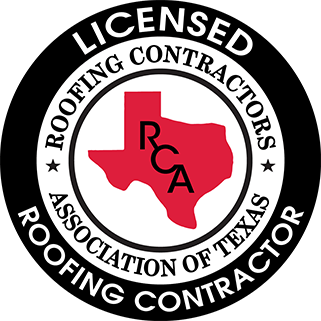 Are they a member of a roofing association that holds its members to high standards, such as the North Texas Roofing Contractors Association, the National Roofing Contractors Association, the Roofing Contractors Association of Texas or the Midwest Roofing Contractors Association? How many years of experience do they have as a roofing contractor in North Texas? Are they insured? What type of insurance coverage do they have and what and how much does it cover? Don’t hesitate to ask a roofing contractor for a certificate of insurance and make sure the coverage is in effect throughout your project. You don’t want to be liable for accidents that occur on your property. Where is the roofing company located? Has your prospective contractor just come to town with the storms? You don’t want to hire a roofer who is operating out of his pickup truck or a temporary post office box. What is the roofing contractor’s warranty on labor? What is the manufacturer’s warranty? Get warranty information in writing. Consider how long your contractor has been in business and where they are located when looking at their labor warranty. Do they have credit references? Ask for a list of local suppliers, and call them to ensure the roofing contractor is in good standing. You don’t want to be left footing the bill for roofing materials. Do they have customer references they can provide? Get a list of previous customers and call them. Will they give you a detailed, written proposal with complete descriptions of the work, start and completion dates and payment schedule? Is the contractor going to obtain the appropriate permits if necessary? Are they asking for money upfront? Homeowners should beware of paying before the job is complete. - A partial payment for materials, however, once delivered to your project location, is not unusual. Are they claiming they are licensed? If so, where? Ask to see their license. If the bid is significantly lower than their competitors, why? If it sounds too good to be true, it probably is. Price is only one consideration when selecting a roofing contractor. Also, a price that is significantly below other contractors’ costs is an indicator that the roofing materials being used may be stolen goods, a growing problem in North Texas that is a federal offense. My husband PJ and I used Elite Roofing a couple of years back and have recommended them MANY times!! This company is an amazing one to work with!! Jimmy, the owner, was fabulous in working with our insurance company to assure that they would cover our new roof. I did absolutely NOTHING besides pick out my new roof and set the dates with Jimmy. Elite Roofing’s crews were efficient, kind, trustworthy and neat. All of those attributes were important to us as we looked for a roofer. Our home was left each night that they worked in great condition and the clean up at the end was perfect! Not only was Jimmy present during the job, but he also is easy to get a hold of now if we have questions.This company is not a “ fly by night” operation, and we love that we know they are around our community should we ever need them! Roofing is never fun and nothing we all look forward to having to do, but Elite Roofing made it a great experience and we continue to recommend them anywhere we can! !